Dental implants are an advanced and permanent solution to tooth loss. They are little screws made of titanium or zirconium that are inserted into your jaw bone to replace the tooth root. After a short time period the dental implants become attached to your jaw bone and can act to secure dentures, replace a missing tooth or all of your teeth. Dental implants should be properly planned and they are a bit of an investment. 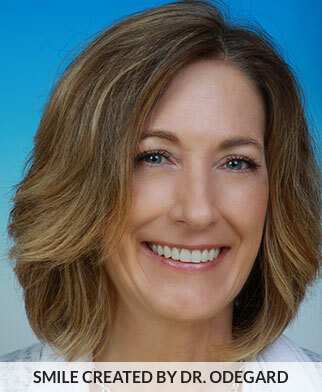 Dr. Odegard has been placing and restoring dental implants for more than 20 years. He is a Diplomate in the ICOI. Check out ICOI.org. Occasionally, ideal areas where dental implants are to be placed do not have sufficient bone quantity to predictably place the implants. In these cases, it is often necessary to graft the area with human bone to create or develop the site for implant placement. This is easily and predictably done in our office. When a tooth needs to be removed the bone around the tooth resorbs away and you can lose up to 40% of the tooth supporting bone within one year. In order to prseserve your jaw bone we recommend that socket preservation procedures be done at the time of tooth extraction. The tooth is extracted and the socket is filled with particulate bone and covered with a membrane. Over time, bone will grow and your ridge will be stronger and wider which provides a nice site for implant placement. We have a special 3D Cat Scan that allows us to evaluate your bone quality, bone quantity, and bone location for the best possible placement of your dental implants. By being able to see your jaws in 3D, we can more safely place your dental implants. Dr. Odegard says that placing a dental implant without a Cat Scan is very risky. We always do a full evaluation, treatment plan and work up before any implants are placed and this includes a 3D Cat Scan.